Castro joins what is expected to be a crowded race for his party's nod to take on President Donald Trump. It is a race that could include more than one Texan as former U.S. Rep. Beto O'Rourke of El Paso faces calls to run after his closer-than-expected loss last year to U.S. Sen. Ted Cruz. While the Democratic field is expected to be large, Castro is among the first to officially enter the race. U.S. Rep. John Delaney of Maryland has been running since 2017, U.S. Sen. Elizabeth Warren of Massachusetts set up an exploratory committee late last month and U.S. Rep. Tulsi Gabbard of Hawaii said Friday she has decided to run and will make an announcement next week. Castro starts the race as a long shot, barely registering in most polls. But he argued he is used to facing an uphill battle as a son of San Antonio's West Side. 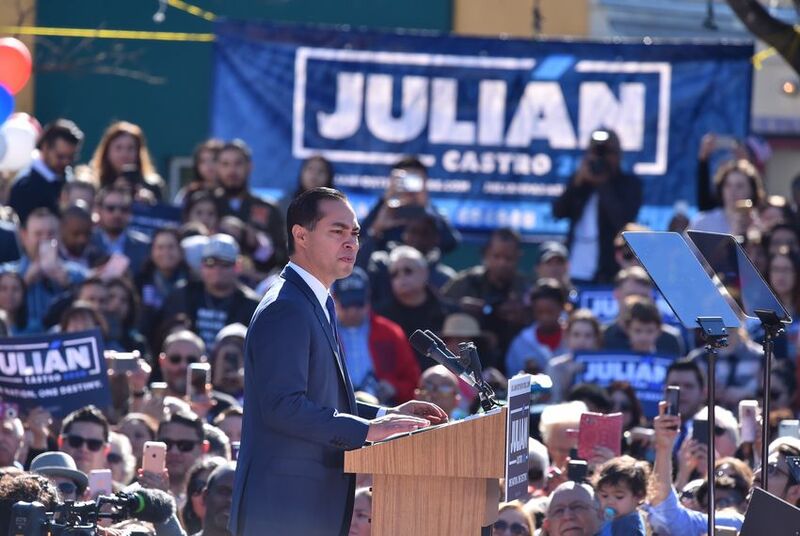 "There are no frontrunners that are born here, but I always believed with big dreams and hard work, anything is possible in this country," Castro said. His announcement was heavy on themes that have long animated Castro's political career: generational change, education and the opportunities that come with it, and the challenges he faced in his upbringing. But he also spoke to the politics of the moment, saying there is a "crisis of leadership" in America today and President Donald Trump "has failed to uphold the values of our great nation." In Castro's speech, he embraced a laundry list of progressive priorities, calling for Medicare for all and a "Green New Deal" to fight climate change. The event was filled with references to the "Pre-K 4 SA" initiative he championed as the city's mayor, and he promised to take it national if elected president. Following his announcement, Castro was set to visit Puerto Rico — an uncommon first stop after a presidential campaign reveal. Castro will attend the Latino Victory Fund's political summit there Monday and see recovery efforts for Hurricane Maria, the storm that devastated Puerto Rico in 2017 and to which the Trump administration's response was roundly criticized. Next week, Castro is scheduled to visit a more traditional venue for White House hopefuls: New Hampshire, the first-in-the-nation primary state. 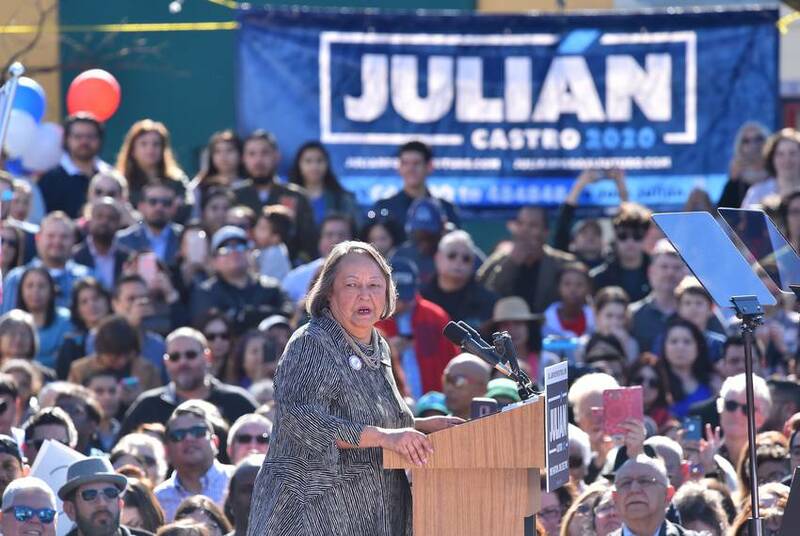 Castro on Saturday also rolled out a campaign leadership team topped by his twin brother, U.S. Rep. Joaquin Castro, D-San Antonio, who will serve as campaign chairman. Another notable name was deputy campaign manager Derek Eadon, a former chairman of the Democratic Party in Iowa. Castro has long been viewed as a rising star in Democratic politics. 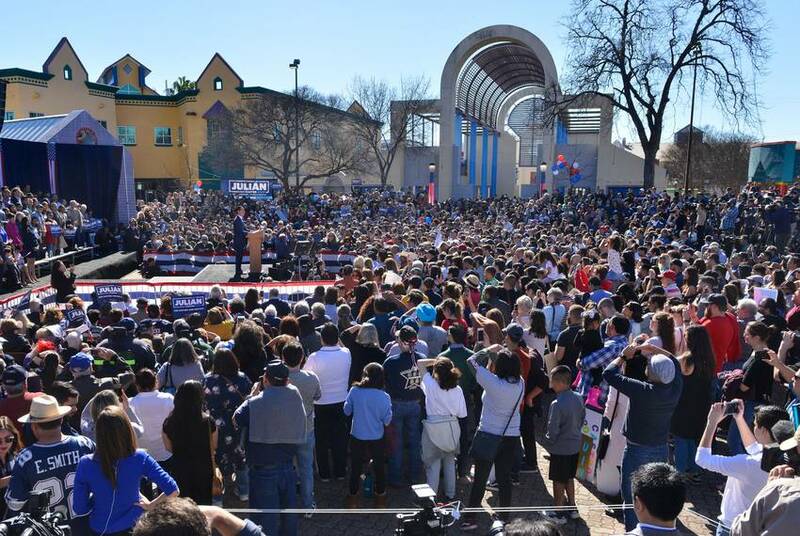 He served as San Antonio mayor from 2009 to 2014, during which he vaulted onto the national scene by delivering the keynote address at the 2012 Democratic National Convention. He was the first Latino to keynote the convention. Castro left San Antonio in 2014 after then-President Barack Obama tapped him to be secretary of the U.S. Department of Housing and Urban Development (HUD). While Castro served in the cabinet, 2016 presidential nominee Hillary Clinton considered him as a potential running mate, a role that ended up going to U.S. Sen. Tim Kaine of Virginia. Since leaving HUD at the end of Obama's presidency, Castro has delivered speeches across the country and taught at the University of Texas at Austin while laying groundwork for a possible 2020 bid. He launched a leadership PAC called Opportunity First, traveled to early voting states to boost midterm candidates and released a memoir. Castro has been among the more transparent potential 2020 hopefuls, saying in November that he was "likely" to run. There was little mystery which way he was leaning when he announced a month ago that he was forming a presidential exploratory committee and scheduled the San Antonio event. Castro continued to visit early voting states in the lead-up to Saturday's announcement, making stops earlier this week in Iowa and Nevada. The mood was festive in the lead-up to Castro’s announcement. 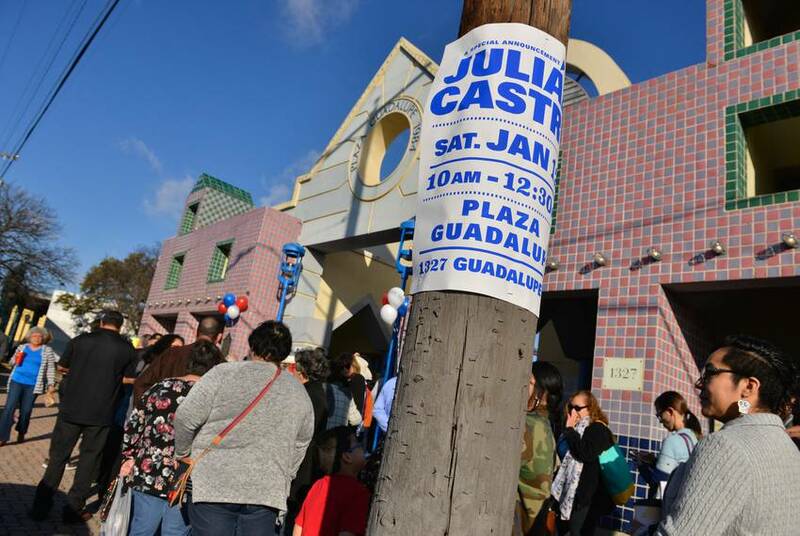 A mariachi band provided music, and campaign merchandise was already available for sale, bearing the slogan: “Julián Castro 2020. One Nation. One Destiny.” A line of people waiting to get in snaked around three sides of the block. And Castro, joined by his brother, broadcast on Facebook Live as he rode the bus route of his youth to the venue, emphasizing the importance of the city’s West Side to his life story. 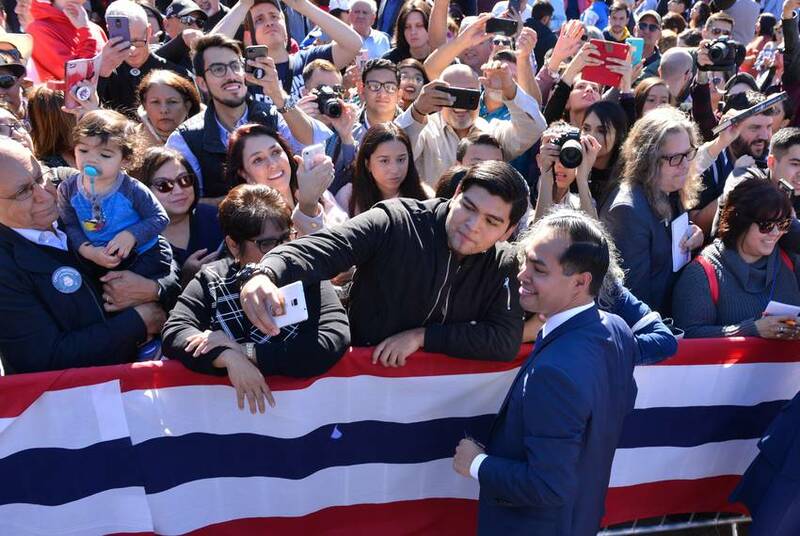 In his own remarks at Saturday's announcement, Joaquin Castro — who spoke before their mother — acknowledged what they expect to be a crowded Democratic field. "I want to be honest with you: There are going to be a lot of great candidates in this race, and a lot of them are good friends of ours and we respect them and we wish them all well, but I know ... we have the best candidate with the best ideas and the biggest heart," he said. Shortly before Julián Castro’s announcement, the Texas GOP sought to frame his candidacy as the latest exhibit in an increasingly liberal Democratic Party. On a conference call with reporters, the party’s chairman, James Dickey, brought up freshman U.S. Rep. Alexandria Ocasio-Cortez of New York, the anti-establishment democratic socialist who recently floated a 70 percent marginal tax rate. It was an idea Castro has brushed off concerns about, noting that the country once set that rate at over 90 percent.